Because it has been published for over 100 years, New Church Life is valued by many readers as a resource for study of the doctrinal thought of the church and as a repository of information on the history of the church organization. 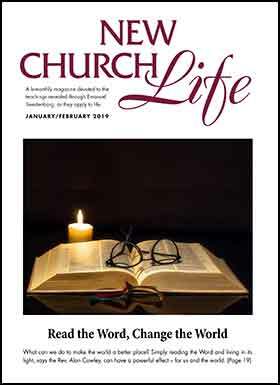 Subscribe to New Church Life magazine ($30 per year), to have the magazine mailed to you. Alternatively, subscribe (for free) to receive email notifications when a new issue is available to read online. Editorials: The Gift of an Understanding Heart • Does God Know the Future? Memorial Address: The Rt. Rev. Alfred Acton II By the Rt. Rev. Peter M. Buss Sr.
We have an archive of other recent issues. The website www.heavenlydoctrines.org allows searching of older issues, including issues back to 1881.